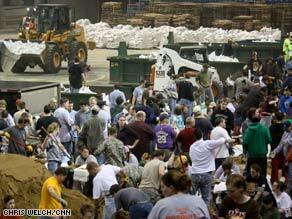 City officials estimated Tuesday that as many as 10,000 volunteers have come forward since Sunday to aid in a sandbagging effort that’s taken over North Dakota State University’s central arena, the Fargodome, and to help build levees along the now closely watched Red River. “We’ve had almost too many volunteers at most of our sites,” said Fargo Deputy Mayor Tim Mahoney. “We’ve been very excited about what’s been going on out there. We’re about 80 to 90 percent complete in most of our areas,” he said, referring to sandbagging and other flood preparations. The fear is that the river could overtake all previous records. As of Tuesday evening, the Red River ran at about 32 feet — 14 feet above flood stage. A record level of 41.1 feet was set back 1897. One hundred years later a flood sent the river to 39.57 feet, in 1997. The record level of the river set in the April 1897 flood could be surpassed Friday, said Cecily Fong of the North Dakota Department of Emergency Services. City officials said the difference between this year and 1997 is the amount of time given to prepare. In 1997, the city had about three weeks to get ready for the coming flood. This year, because of unforeseen warmer, wetter weather that moved things up dramatically, and residents have had half that time. “We’re concerned about the rise of the river and how fast it’s coming up, so our concern is that we’re going to hit 41 feet,” Mahoney said, adding that the way the levees are currently set up, they would protect against overflow only up to 38 feet. Officials are guessing the river, which runs through the eastern parts of North and South Dakota and western Minnesota, could crest in Fargo — North Dakota’s largest city with about 99,200 residents — any time Friday or Saturday and that the water may linger at its crest height. The city has canceled all trials scheduled in Fargo Municipal Court through April 2 because of the expected flooding, to allow all police officers to be available for any possible emergencies, according to the city’s Web site. Since efforts began over the weekend, Fargo residents and out-of-town volunteers have filled over a million sandbags out of the needed two million. Mahoney said he hoped that through a 24-hour sandbagging effort at the Fargodome, that goal will be met by Thursday. See map of affected area » Another factor threatening efforts is the possibility of freezing temperatures, because sandbags freeze together and then aren’t individually stackable. Despite the stress, volunteers have been working around the clock in a massive group effort. “You got old people, young people — all helping out,” Mahoney said. “It’s heartwarming to see how many people are here.” North Dakota State University canceled classes Tuesday and will do so again Wednesday. NDSU student Justin Swank said the common cause has even pushed aside bitter school rivalries. “I was sandbagging with people from UND (the University of North Dakota) [and] NDSU doesn’t like UND,” Swank said. Mahoney said the state has received helped from the federal government, including local response from FEMA, and about 800 North Dakota National Guard troops. The Coast Guard announced Tuesday that it will also be assisting with efforts in the state.